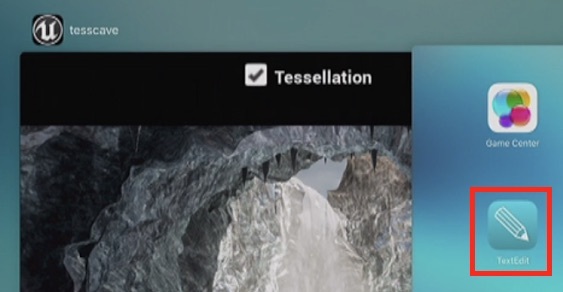 During its What's New in Metal, Part 1 session at WWDC 2016, Apple used an iPad to demo the graphics API's new adaptive tessellation capabilities on iOS 10. At the 17:58 mark of the video, a TextEdit icon can be seen on the iPad's home screen from the multitasking app switcher screen. TextEdit is Apple's basic word processor preinstalled on macOS Sierra and previous OS X versions, but the company has not released a mobile version for iPhone, iPad, and iPod touch as it has done for some of its other first-party Mac apps. There are also no third-party apps that fully match the app shown in the screenshot. TextEdit and Preview icons were previously spotted in a pre-release iOS 8 screenshot, but neither of the apps were included in the public version of the software update. An early 2014 report had said both apps would debut on iOS 8 as read-only document viewers for Preview and TextEdit files stored in iCloud from a Mac. While there is an outside chance that Apple plans to release a basic text editor on iOS to complement Notes and Pages, the most likely explanation is that TextEdit serves as a simple "Hello World" testing app for internal developers. Apple is known to have several internal apps for use by software engineers and employees only. Game Center is also shown, despite being removed as a standalone app on iOS 10. Apple previewed iOS 10 at its WWDC 2016 keynote on June 13 and has seeded the first beta to developers. A public beta will be available in July ahead of an official launch in the fall. iOS 10 is compatible with most devices that can run iOS 9, excluding the iPhone 4s, iPad 2 and 3, original iPad mini, and fifth-generation iPod touch. Is it sad that this intrigues me way more than anything in their presentation? Love the commitment of :apple: fanatics combing through the WWDC video. Well done. If we already have Pages and Notes (free) AND they're pushing 365 (paid), can someone explain why we'd need TextEdit as well? Not intended to be snide, could just be something I'm overlooking lol. Neither Pages nor Notes are designed to handle plaintext documents. Textedit is. I suppose it is something thats more useful to web designers and programmers than your average user. But then again it would let you open more files from your desktop now that we have access to that through continuity. I think that if Apple put TextEdit on the App Store, then it would serve a purpose for those who have files on a Mac that are of some use. But for the majority of users, including it as a stock app would only confuse them as Notes and Pages are useful enough. One upside however is that the app is bound to be very small in size, compared to Pages 500+mb. I would be happy with this. I still use Text Edit on the Mac all the time. All of those documents are stored in iCloud these days. To have those available on iOS, like almost everything else, would be great. I don't use Pages. Too much overhead. Hard to explain. There's a difference, and TextEdit is what I want. I'm kinda curious how did it take a week to get spotted. Regardless, if implemented, I think it would be nice (but to be fair, I don't see if that's very important when we have Notes for small notes and Pages for actual text). With TextEdit having iCloud storage of documents, I'm surprised they either haven't released an iOS version, or added a link to Pages on iOS to access these TextEdit documents stored in iCloud. I can't see much point. It would make more sense to have a preview app for PDFs for example. The fact that game center is installed too only tells me this is some apple level developer build probably.